Ready for some leisurely Sunday reading? 1. Rental Vacancies. It's at a 5 year low outside the Denver area according to the Colorado Division of Housing. That's the lowest level since 3Q01. Average and median rents are also at record levels. The tightest rental markets are in resort areas. 2. Housing Statistics. Obviously we're big fans here at Realty Unique. But have you read the American Housing Survey? Released in August, this 616 page tome is filled with fascinating information about the housing market. For example, 60% of all housing units in the country are owner occupied, 28% are occupied by renters and 12% are vacant. Of the vacant homes, only 24% are available for rent. Here are some more unsettling statistics. 4.6 million housing units in the suburbs do not have safe drinking water. 1.8 million homes have holes in the floor and 840 thousand have exposed wiring. Meanwhile 240 thousand homes have no wiring at all. I'm guessing those are mostly cabins in the woods. Still, we have friends here in Boulder who grew up in Homer (Alaska) and didn't have running water or electricity. Hat tip: blueroof.com blog. 3. 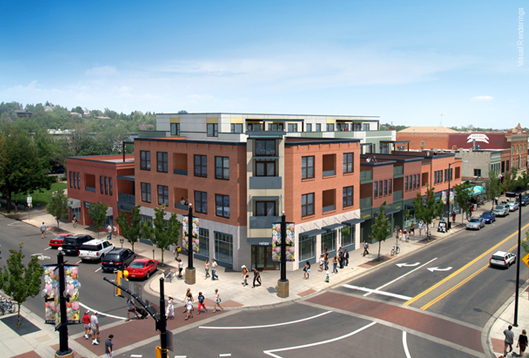 Pearl Street Developments. East of the mall, the street is continuing to develop at a blistering pace. What used to be a hodgepodge of shops in an old warehouse at the corner of 15th and Pearl Street is now a big hole in the ground. The quirky craft shops are gone and construction of a large mixed use building is underway (by Coburn Development). The image on the right is what it's expected to look like when it's done (click for a larger image). The 21,000 sqft building will feature 22 residential units and 14,000 sqft of commercial space. Some of the loft units will have roof decks with views of the walking mall and mountains. Meanwhile, 2226 Pearl Street - home of Moroccan restaurant Mataam Fez - has been sold and will be scraped to make way for 2-4 luxury condos with price tags ranging from $1 to $2.2MM. 4. Roadways and Infrastructure. Know that slow and congested interchange at US36 and Wadsworth in Broomfield (also CO121, CO128, and US287)? The one with all the lights and lane patterns. It looks like Broomfield just got $3.7 million in funding from the federal government to help fix it. The total tab is expected to be $70 million, according to the Daily Camera, "The project will eventually create a six-lane road that starts near the intersection of Colo. 121 and Colo. 128, crosses over U.S. 36 and runs under the railroad tracks east of Old Wadsworth Boulevard before joining 120th Avenue near Teller Street." 5. The Environment. As you probably know, Boulder passed the first carbon tax in the country in November. Aimed to help us reach Kyoto targets (yes, Boulder passed it even though the Federal Gov't didn't), the tax is controversial and expected to add about $16/year to the typical homeowner's electric bill. Money raised will go towards energy efficiency initiatives and encourage the use of wind and solar power. By signing up 1,100+ subscribers to wind power, we've also become an official green community, the first in Colorado. Curious about your green house gas emissions?